ICCRI will be held every year to gather the authors and editors of International Journal of Mechanical Engineering and Robotics Research for communication and exchange about their research results and the problems they have encountered during their research. Selected papers submitted to ECMMM will be invited to revise for fast track publication in IJMERR. 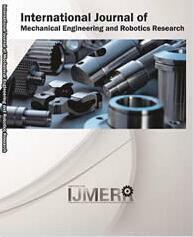 Submissions will be peer reviewed by both technical committees and IJMERR editorial board, and accepted papers will be published in International Journal of Mechanical Engineering and Robotics Research as a special issue, which will be indexed by Scopus, Index Corpernicus, ProQuest, UDL, Google Scholar, Open J-Gate etc. If you're NOT expecting any publication of your paper, it's acceptable to submit just your abstract to the conference for oral presentation, which will be sent to at least two techinical committees for a brief review, and it will take about 10 working days. Prospective authors are invited to submit high-quality manuscripts written in English. The submission of a paper implies that the paper is original and has not been submitted to elsewhere for possible publication. All submissions will be peer-reviewed by experts in the field based on originality, significance, quality and clarity. You're required to format your paper by using IJMERR Template before submission. If you just plan to submit your abstract, then please use Abstract Template. Thanks to your big support. ICCRI 2019 has run smoothly in Hong Kong during April 5-7. See you again next year. (Click). Final call for submission. The submission deadline has been extended to February 15, 2019 (Click).